Policemen from the Oko-Oba division in Ojokoro Local Council Development Area of Lagos State last Sunday February 21st arrested the General Overseer of the Victorious Sacred Solemn Healing and Deliverance Ministry, Prophet Oluwaseyi Idowu, for allegedly impregnating two sisters. 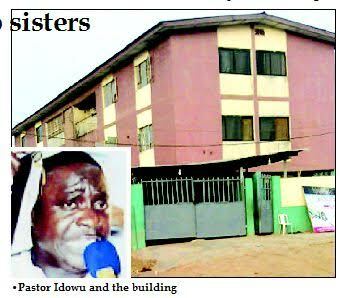 According to The Nation, the pastor was invited to set up his church and manage a flat in the two sisters’ father’s compound when he had accommodation problems in Agege. “I and my brothers bought my father a two-storey building in Ogunsola close, Abule-Egba and at that time, Pastor Oluwaseyi had rent issues. My father allowed him to set up his church in his compound and also manage a flat. We never knew that was the beginning of our problems. The pastor held several vigils to create awareness and public attention. As time went on, he invited people to stay in the church and from the church they moved into the main house. Occupants left the house for the pastor’s people to move in and they lived there without paying a kobo. Months later, the pastor said he wanted to marry my 20-year-old sister, a virgin, who just graduated from secondary school. We never knew he had been sleeping with her for months before then. Recently, we found out that he also impregnated my 25-year-old sister who has been indoors for the past nine months. I called my elder brother who told me to report the case to the police. It was at the police station we found out that he intended to sell our building to build a new church elsewhere.”. The Pastor has since relocated from the area after his church members vowed never to return to his church again.